BEIJING, Sept. 2 ,Chinese Premier Li Keqiang on Sunday met with Sudanese President Omar al-Bashir ahead of the 2018 Beijing Summit of the Forum on China-Africa Cooperation. China is willing to work with Sudan to tap potentials and explore new ideas, strengthen cooperation in the Belt and Road development, and expand pragmatic cooperation in such areas as trade, investment and agriculture, in order to make new contributions to economic and social development in the two countries, Li said. 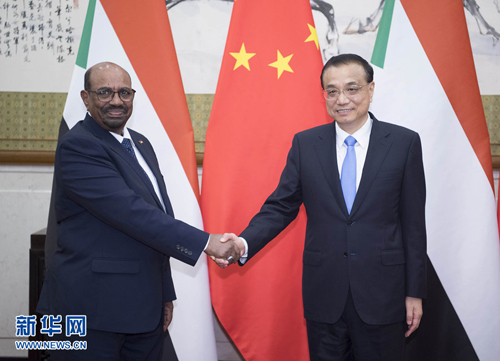 Al-Bashir appreciated China's long-time help to safeguard the stability and development of Sudan, noting that the two countries' pragmatic cooperation in various areas has been fruitful and has broad prospects.